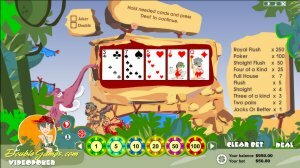 Soft14: Prehistoric Videopoker - Prehistoric Videopoker has all the charm and drama of a poker game. When you download Prehistoric Videopoker you hear funky background tunes echo in the jungle around the video poker machine. You see a mammoth, it helps you by placing your bets with its trunk, and your winnings flow freely into the capture basket. And a caveman who strolls past dragging his prehistoric wife behind him back to the cave. He is extremely indignant at this stupid woman because she has bought a new dress! Just now when he wants to acquire a big axe! He can't realize how it is possible to spend all their wealth, including stones of different colors, sea shells and fangs of a tiger killed by him, and to buy the dress! Because of it, he will injure her face a little bit and then he will force her to exchange this dress to the axe. Yes, there is plenty to see and be entertained by in this unique Prehistoric Videopoker game. There is plenty to win too and the more you practice the more skills you acquire giving more chance to win. The beauty of Prehistoric Videopoker is you can play poker by yourself. You can hold the cards you choose and be dealt again to have more chances of being a winner. Simply click on the cards you wish to hold. If you change your mind you can click again to un-hold them. This game is a variation of the classic game of poker, but you will love its style and humor. It is a game where you can enjoy at the fun of poker from your own computer.